Route 313, eleven miles north of Moab, leads you to places that, well simply take your breath away. Merrimac and Monitor Butte are an eyeful of wonderful. There is Dead Horse State Park known for its famous "gooseneck", and where the Grand Canyon scene from the movie "Thelma and Louise" was actually filmed. Then there is Canyonlands National Park - Islands in the Sky", and it is absolutely one of the most gorgeous areas to visit. Part of Islands is the overlook of Shafer Canyon and the Shafer Trail; but you can also drive the Shafer Trail to either Potash Road (Route 279), slightly north of Moab; or venture deeper into the canyons via the White Rim Trail. This is going to be a three part write up; Part One - the start in Canyonlands to the Potash Road/White Rim Trail junction; Part Two will be from the junction to Potash Road; Part Three will be the White Rim Trail up to Musselman Arch. Lets go with a little warning first; 4 wheel drive is a must! While the road from Canyonlands to the junction is well maintained; afterwards, yeah, not so much. There are rocks, rutted spots, pieces of missing road, and a riverbed or two you need to drive on, not cross, but into and along until you reach a trail again. We did see a couple of cars start from the other entrance via Potash Road and wished them a lot of luck; I bet the owners were driving rentals, or had really good auto mechanics. By the way, it even states on the information boards that 4 wheel drive is a must; so I'm not making this all up to scare you off. What visitors to Grand and San Juan Counties don't understand, or want to understand I feel sometimes, is that the roads were made around the landscape; the landscape was not changed to make the roads convenient. For the most part, the road is smooth dirt and wide for two vehicles to pass each other; there are pull in spots when the road narrows to allow one vehicle to go, while the other waits. Basically being polite and patient when other vehicles are around will make for a safer and happier ride; really folks, leave the road hogging/raging at home. We knew this was going to be an all day adventure, so took our time to explore our surroundings. Waves carved into walls by wind and water. Now Roy and I usually take picnics with us when it's an all day trip; this time we were in the mood for Burger King...it happens, get over it! Being the characters that we are, we decided to take a photo of our hands holding our sandwiches with Shafer Canyon as our backdrop. I did send the photo to the Burger King head office, but still have not heard from them; most probably won't. There is a large pull in area at this curve in the road, so plenty of room to picnic and enjoy the outstanding view. We could see the overlook up above us, so knew what was in store once we began driving again. See, when you first begin traveling the Shafer Trail, you don't feel as if you're traveling downward very much until you turn a corner and see how far below the walls you are. As you pass under the overlook though, there is no doubting you're going down, down, down...to Goblin Town; well not really. Lovers of the movie, "Labyrinth" will get the reference. I don't know about you, but I love the descents; that's when my adrenaline really gets pumping! Before you know it, you're at the bottom, looking back up, and saying, "Holy sh*t, I can't believe we just did that!!!" Then you look ahead and wonder about what's next. The junction; straight ahead takes us down the White Rim Trail; to the left, the Shafer Trail continues until it reaches Potash Road, Moab. One last look at where we had come from before moving onward. Part Two will be the Shafer Trail to Potash Road; but that's not exactly what we did. We did a portion of the White Rim Trail, but I'm going to make you wait for that. Yes, I can be evil, very evil. Muhahahaha. Based on your map, it looks like the Shafer Switchbacks are quite a ways away from Moab? Many do not realize this, but Canyonlands National Park (north and south sections) is actually in San Juan County Utah; not Grand County. The southern end is accessed via Route 211, north of Monticello; the northern end is accessed outside of Moab on Route 313, but there is still a 45 minute ride down into San Juan County. 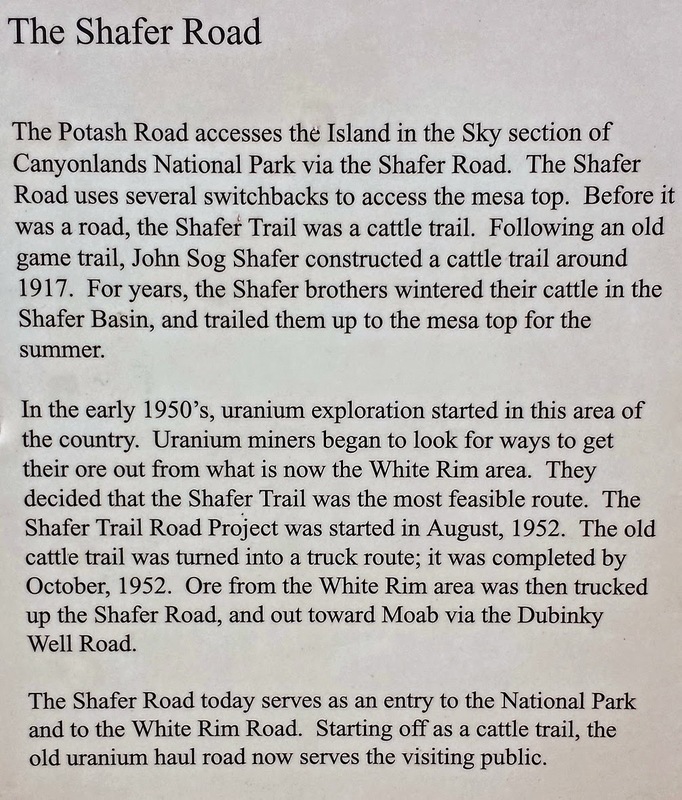 So, yes, Shafer Trail is away from Moab, but driving it, you will eventually end up on Potash Road which takes you to the northern entrance to Moab.